Make sure that you reset minimum book month to exactly the first month of business and close all other windows within windward including the browser page. Tip(cm): setting minimum book month to 00/0000 will set minimum book month to the no book month setting. The minimum book month will then show as "MM/YYYY". The Move Departments routine is located in the Toolbox as show in Figure 1.
from a client PC, but should not take as long from the server. After the license codes have been installed the Move Departments Routine shown in Figure 1 should be run moving Department 0 to Department 1. If the company was originally created with departments then no move department routines need to be run. For directed assistance with configuring departments please contact us and speak with your sales manager about System Five Implementation Solutions. Any pending transfers (Transfer Delayed) will need to be voided or completed. If the departments are removed while these transfers are still pending then the stock will be “lost” creating a stock discrepancy. Each department including department 1 will need to be moved into department zero using the Move Departments tool shown in Figure 1. Start with the highest numbered department and move it to zero, then go to the next highest department number until department 1 is moved into department zero. Removing the departments from System Five requires license codes that have the departments removed. 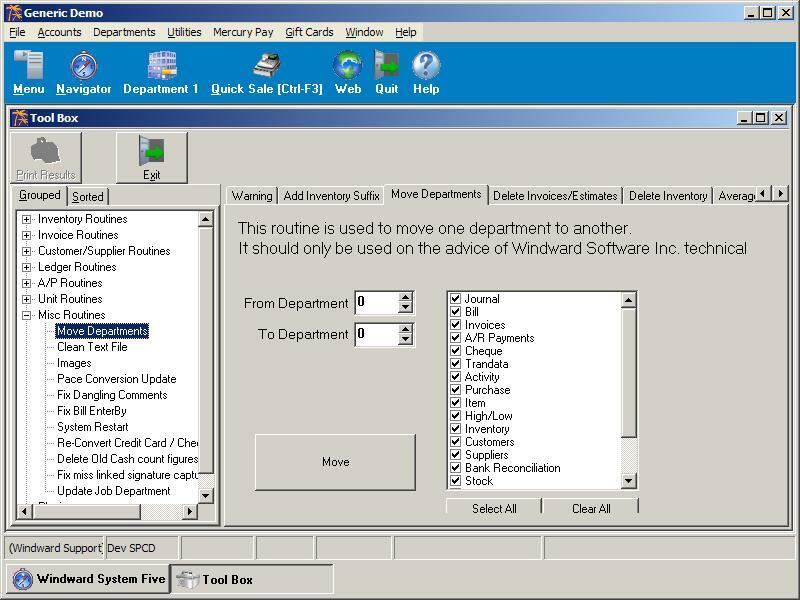 The Windward Account Manager will need to be contacted prior to the remove departments activity so new System Five license codes can be issued. The following video summarizes the procedures for collapsing the departments in System Five. First thing to be considered is in the real world, is my shop closing or are two shops being merged together. If my shop is closing I may wish that all transactions from that shop end up in the head office. This would mean moving department four to department one. If I have two shops that are merging I may wish to move all the transaction from one into the other. This would mean moving department four to department three. Install new System Five license codes. Any pending transfers (Transfer Delayed) will need to be voided or completed. If the departments are removed while these transfers are still pending then the stock will be “lost” creating a stock discrepancy. These transfers may also appear as Invalid Department integrity errors if they are not removed. The department will need to be moved into another department using the Move Departments tool shown in Figure 1. Removing a department from System Five requires license codes that has the department removed. The Windward Account Manager will need to be contacted prior to the remove department activity so new System Five license codes can be issued.